Escape to the clean, green, wildly sophisticated frontier of Bellevue, Washington and the Pacific Northwest. Nestled between two mountain ranges on the shores of Lake Washington, Bellevue is just 9 miles east of Seattle and 17 miles from Seattle-Tacoma International Airport. 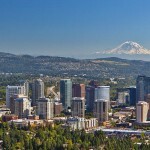 Bellevue boasts the most upscale shopping experience on the West Coast, north of San Francisco. Safe and easily accessible, downtown is a vibrant fusion of hotels, restaurants, nightclubs, culture, recreation and the convention center all in about six square city blocks. Bellevue is the fifth largest city in Washington, U.S. It is the high-tech and retail center of the Eastside. During the holiday season, the Garden d’Lights display at the Bellevue Botanical Garden attracts visitors from far and wide.